For the historical Grandmaster of the Teutonic Knights, see Konrad von Wallenrode. Konrad Wallenrod, a painting by Władysław Majeranowski (1844), National Museum in Warsaw. Konrad Wallenrod is an 1828 narrative poem, in Polish, by Adam Mickiewicz, set in the 14th-century Grand Duchy of Lithuania. Mickiewicz wrote it, while living in St. Petersburg, Russia, in protest against the late-18th-century partitioning of the Polish-Lithuanian Commonwealth by the Russian Empire, the Kingdom of Prussia, and Austria. Mickiewicz had been exiled to St. Petersburg for his participation in the Philomaths organization at Wilno University. The poem helped inspire the Polish November 1830 Uprising against Russian rule. Though its subversive theme was apparent to most readers, the poem escaped censorship due to conflicts among the censors and, in the second edition, a prefatory homage to Tsar Nicholas I. Though Mickiewicz later disparaged the work, its cultural influence in Poland persists. In a preface, Mickiewicz briefly outlines the history of the region, describing the interactions among the Lithuanians, Prussians, Poles, and Russians. 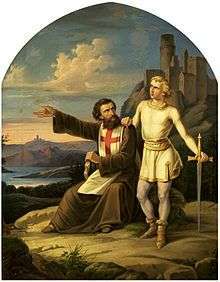 The following six cantos tell the story of Wallenrod, a fictional Lithuanian pagan captured and reared as a Christian by his people's long-standing enemies, the Order of Teutonic Knights. He rises to the position of Grand Master, but is awakened to his heritage by a mysterious minstrel singing at an entertainment. He then seeks vengeance by deliberately leading the Knights into a major military defeat. It transpires that Wallenrod has a wife, Aldona, who has been living in seclusion. The Knights discover his treason and sentence him to death; Aldona refuses to flee with him. He then commits suicide. The concept of "Wallenrodism" (Polish: "Wallenrodyzm") — the striking of a treacherous, possibly suicidal, blow against an enemy — and certain powerful fragments of the poem, have become an enduring part of the Polish psyche and found resonance in the Polish uprisings of the 19th and 20th centuries. The poem included a reference to Machiavelli's dictum that a leader must be both a lion and a fox. Its encouragement of what would later be called "patriotic treason" created controversy, since its elements of deception and conspiracy were thought incompatible with Christian and chivalric values. Mickiewicz was taken aback by the strength of the public response to his poem and regretted its publication; before his death, he expressed frustration at his financial inability to buy back and burn every copy of what he described as a mere "political pamphlet." Konrad Wallenrod has twice been turned into an opera: as I Lituani (The Lithuanians), by Italian composer Amilcare Ponchielli (1874); and as Konrad Wallenrod, by Polish composer Władysław Żeleński (1885). The Polish composer Frédéric Chopin may have based on this poem his Ballade No.1 in G minor. The Polish-born author Joseph Conrad, who had been christened Józef Teodor Konrad Korzeniowski, may have selected the second part of his pen name as an hommage to the poem's protagonist. Mickiewicz's poem influenced Conrad's frequent explorations of the conflict between publicly attested loyalty and a hidden affiliation with a national cause. 1 2 3 Jonathan Bellman (2009). Chopin's Polish Ballade Op. 38 as Narrative of National Martyrdom. Oxford University Press US. p. 72. ISBN 978-0-19-533886-7. 1 2 3 Christopher John Murray (2004). Encyclopedia of the Romantic Era, 1760-1850, volume 2. Taylor & Francis. p. 740. ISBN 978-1-57958-422-1. 1 2 3 4 Czeslaw Milosz (1984). History of Polish Literature. University of California Press. p. 220. ISBN 978-0-520-04477-7. 1 2 Richard Andrew Cardwell (2004). The Reception of Byron in Europe, volume 1. Continuum International Publishing Group. p. 310. ISBN 978-0-8264-6844-4. ↑ Jean M. Szczypien (1998). "Echoes from Konrad Wallenrod in Almayer's Folly and A Personal Record". 53. University of California Press: 91–110. JSTOR 2902971. ↑ George E. Marcus (1993). Perilous States: Conversations on Culture, Politics, and Nation. University of Chicago Press. pp. 204, 205. ISBN 978-0-226-50447-6. English translation of Konrad Wallenrod. M.A. Biggs, 1882. This article is issued from Wikipedia - version of the 1/10/2016. The text is available under the Creative Commons Attribution/Share Alike but additional terms may apply for the media files.